This wedding drama never ends. I decided I wanted to add more items to my Macy's registry. 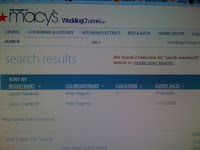 So I was having trouble trying to log in and I decided to just search for our registry. Nothing comes up if you search for my name. So I guess I don't exist. I decided to check under Jake's name....and I found two entries. There are two Jake Wambolds, and two Kelly Hagertys!!! And one is getting married on 11-11-09. Which I know I don't even have to bother telling you that's my birthday. I know everyone knows.